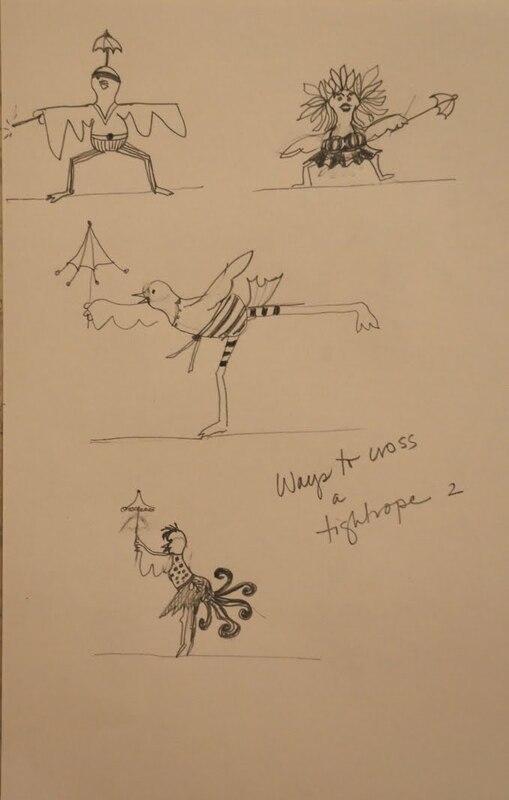 How Would You Walk a Tightrope? 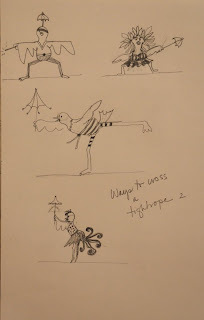 Direct from the pages of my sketchbook, here are a few ways one might tiptoe, dance, scoot or leap across a tightrope. Which one might be you? 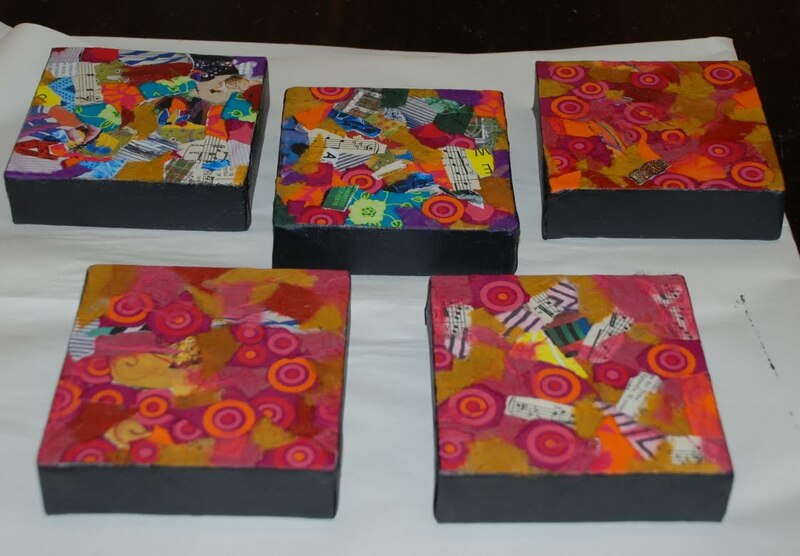 My plan is to do a series of five little paintings on 5 x 5 canvas with collage under paintings. That's all I have for now, dear readers. 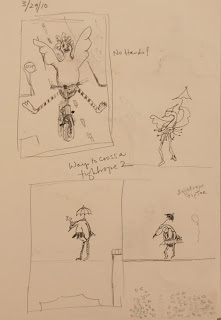 Back and blogging. What a difficult transition from lazing in bed until 8, rising to play cards, shop and eat Mexican food, back to the daily grind of painting every day (anybody feel sorry for me???) Seriously, though, I was a little while finding my groove again, so it has taken me longer to get back to my blog than I expected. I am really looking forward to seeing what you all have been doing for the last two weeks. Before I left for Houston, I had begun what I plan to be my last four large pieces for the June/July show. This is the first one of those four that I have worked on, and you can see that I am not finished yet. I will paint the umbrella and the daiquiri glass and continue to work on lights and shadows, among other things. Don't forget to click on the image to enlarge and see detail. Look for the place where I changed my mind about how to do the sunglasses! I plan to finish these four in April and spend May working on publicity, varnishing and framing. Somewhere in there I will squeeze in time to paint on smaller works to add in nooks and crannies. There! My goal is stated, and I'm accountable. The race is on. I always forget to tell you to click on the image to see it a little larger. 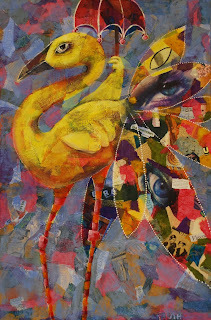 It does give more idea of the way it was created and how the paint and collage work together. Please do that with Duet. 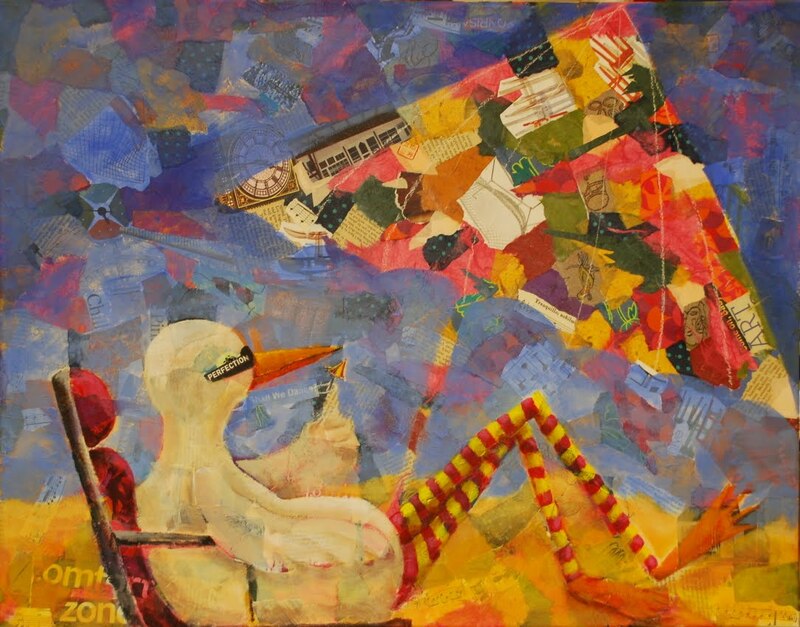 Especially, I got feedback that the painting in my last post looks so different in person that I encourage folks to click on the photo in this post to see the detail of the collage. It is more interesting than it looks from "far away!" It is likely that I will not log any posts for a couple of weeks because I will be away visiting my folks in Texas. I will miss you all, my blogging friends! See you towards the end of March. 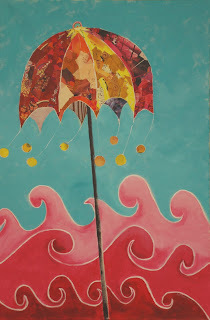 On I go exploring the world of umbrellas in collage and acrylic paint. 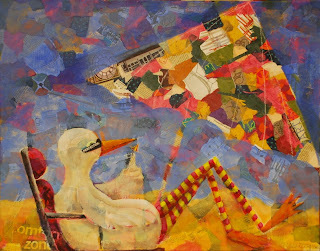 I SO want to be sitting in this painting (where you cannot see me in my bathing costume!) I'd be able to feel the salty, humid wind whistling by my ears. Occasionally, I'd hear the call of a gull over the roar of the surf. And endlessly, I'd see the waves roll onto the sand nearer and nearer my sheltered spot. This piece isn't finished. I still must work on the sand and shadows. But this photo gives you an idea of what I have in mind. Welcome, new followers. Thanks for such lovely comments everyone. I'm having such fun working on a larger scale for me. The size works for this show vary between 18 x 36 to 30 x 40. 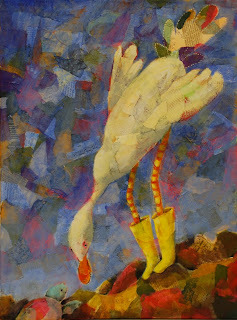 However, I also like to work very small, and I will be including some of them in this show, too. 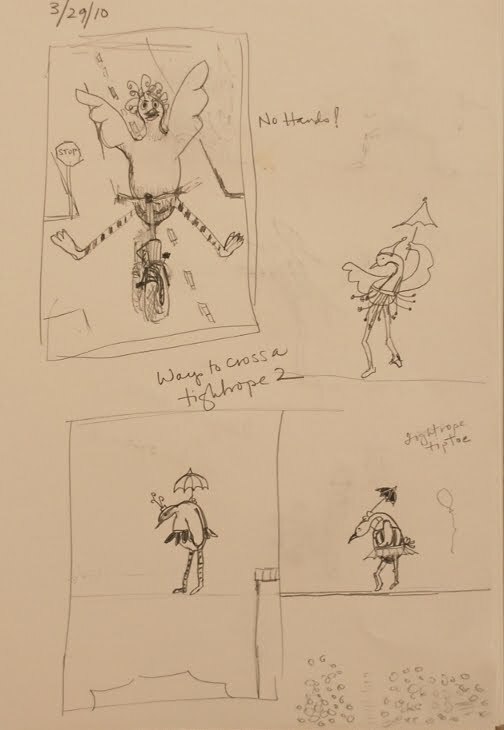 What is your favorite size to create? Enormous thanks to all of you who commented on my last post. I got behind with writing to each of you, but I appreciate all the nice remarks. You guys rock! I can't imagine what goes on in your head! 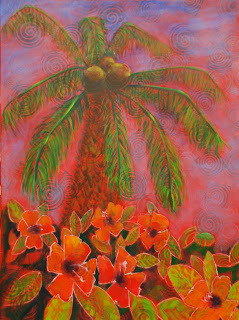 I still have work to do on this to separate the foreground and the back ground and to bring back some more life to the palm branches. I also need to brighten up the coconuts. 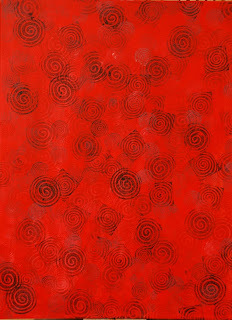 I began with an under painting of naphthol red and printed spirals of all sizes over the canvas. Then, I saw the palm tree trunk in the patterning of the prints. 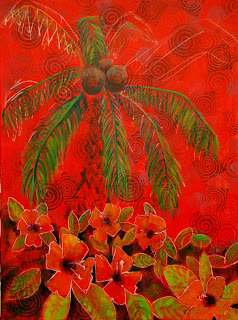 I began adding the tree and a foreground undergrowth of hibiscus flowers, centering them over some of the bolder spirals. It's March! I feel the approaching spring in the breezy, warmish day. Blow leonine winds, blow---I think I'm going to make it to summer. And in honor of the typical beach day on the Texas Gulf Coast, I give you Hot and Hazy. Welcome newcomers to my site. I hope everyone some time to make art today!